The AHA/BHA Refining Scrub is a cleanser that is designed to balance oily skin and to clear out pores. Just like the Omorovicza Refining Facial Polish that I reviewed a few weeks ago, this is both a chemical exfoliator and scrub based exfoliator in one. It isn't as concentrated with scrub based exfoliants as the Renewing Microdermabraison Complex. It contains Jojoba beads and Alpha Hydroxy Acids, but on the flip side is also free of soaps, parabens, plastic microbeads and animal derived ingredients. It comes packaged in a white bottle that holds 88ml of product and comes with a black pump cap to dispense the product. To use, you need to wet the face and massage a small amount into the skin in upwards circles. Rinse and then pat dry. The first thing that you notice with this scrub is the beautiful cooling effect that it has on the skin. I would assume that this is down to the peppermint and eucalyptus oils that are included in the formula. You can really feel the cooling sensation when you use this, it's a nice treat for the skin. During the hot weather that we've had here in the UK recently as well it's been an extra treat! Other than the cool, fresh feeling that it has, this scrub doesn't irritate the skin. It is really gentle but at the same time highly effective. Once rinsed and dried, the skin feels smooth and looks clear as well as feeling really clean thanks to that beautiful cooling effect. 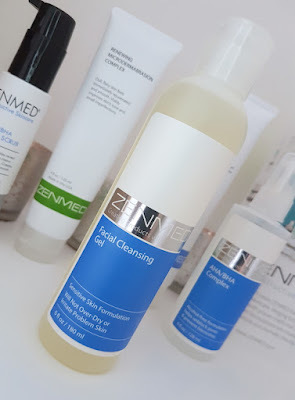 I also find that it has worked really well at prepping the skin for the next stage of the routine whilst also doing a great job at helping to reduce blemishes and post-blemish marks. The main problem I had with this scrub was the pump; the product was really clogged inside of it. It was possible to dispense some of the product from it, but the actual beads of Jojoba wouldn't come out, so it was just a regular liquid face wash coming out of the pump. It's not often that you see scrubs having a pump dispenser like this and I imagine that the reason was because of issues like this. I mentioned in the first half of this post that I received a push cap that fits on a range of the items I received, so this is the product I chose to swap the cap on. Since using the push cap I have had no issues whatsoever with dispensing the scrub properly, but some of the product had to remain stuck in the tube within the pump which was a shame. Overall though, this is a great exfoliator to try if you have oily skin. It's great for blemishes as part of a full anti-blemish skincare routine, but alone it is good for helping with oily skin too. The Facial Cleansing Gel is a ph-balanced cleanser that is designed to be super gentle and non-drying on troubled skin. It contains Certified Organic Aloe Vera Gel to cleanse the skin without the harshness of soaps and to prevent over-drying the skin. In addition, it contains a Vitamins A, B5, C and E, coconut derived cleansing agents and a blend of essential oils. To use, you need to wet your face and massage a "generous" amount of cleanser into the skin. Rinse well and pat dry. This Cleansing Gel foams up really well and spreads easily across the skin. It's gentle and doesn't irritate any sensitive areas or make blemishes worse. I do find that it helps with blemishes somewhat alone, but not as much as the other products and the combination of them. If your main concern is spots, this wash alone won't be the cure. 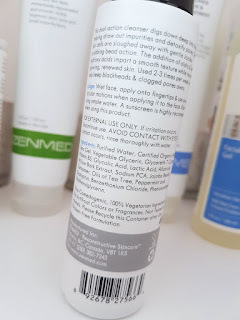 I do recommend trying it along with the other items I've reviewed over these two posts, and I also recommend having a look at this if you suffer with over oily skin. With that all said, I do find it to be quite drying at times. However, I haven't encountered anything that a bit of moisturiser hasn't been able to fix easily. As soon as I follow it up with a moisturiser I haven't seen any dryness until the next time I use it. Otherwise, this cleanser leaves the skin feeling clear and clean and also helps a lot in regards to keeping excess oil under control. 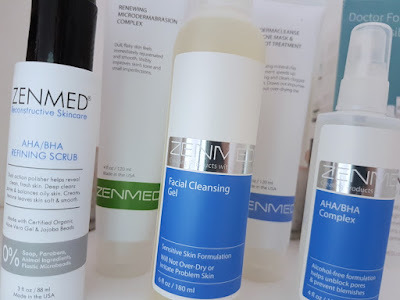 Overall, I've been really happy using the Zenmed range. 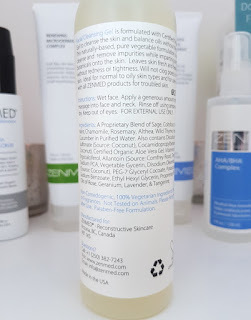 I explained the results I've had from the combination of all of the Zenmed products within my previous post, so I won't go into a ton of detail again here. However, I will say that if you are at your wits end with dealing with spots or over oily skin, I highly recommend checking out the range. There are a lot of options to choose from, so whether you want to try out just one item of the whole lot, there should be something here than you can find helpful. If you don't suffer from oily or blemish-prone skin, Zenmed do have products for other skin concerns that you can check out too. You can purchase the AHA/BHA Refining Scrub and the Facial Cleansing Gel from Zenmed (US based but worldwide delivery, potential customs charges) and Dermacare Direct (UK based). 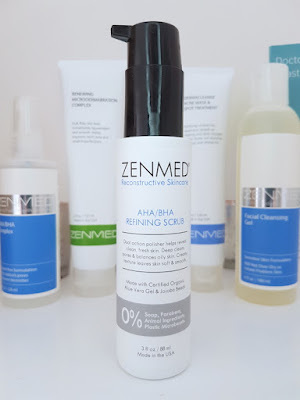 What are your thoughts on the AHA/BHA Refining Scrub and the Facial Cleansing Gel? What are your thoughts on the collection I've discussed on the blog over the last two posts in general? 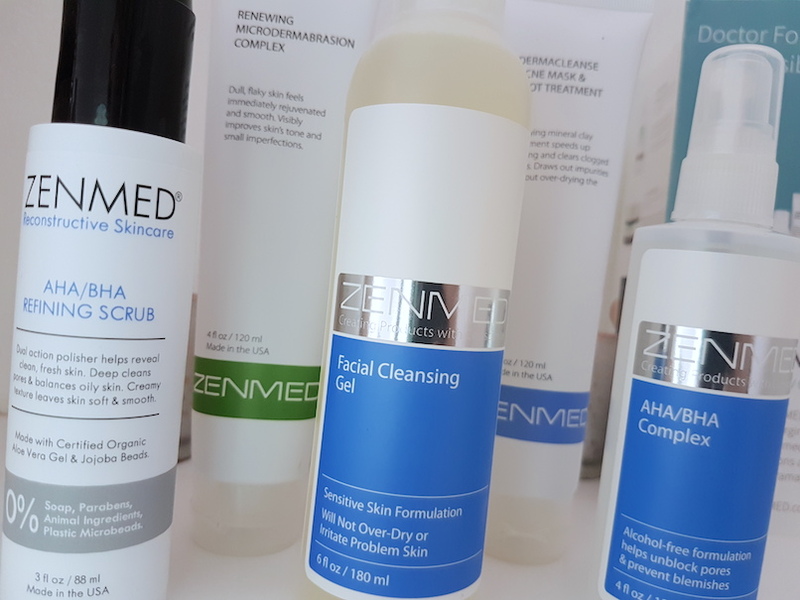 I love the skin care products of Zenmed.They are cruelty and vegan free products which give extra coverage to the skin. Thanks for it.